For over 20 years, Drake Passage has been the most comprehensively observed part of the Southern Ocean. It provides the link between the Pacific and Atlantic Oceans, and it constricts the Antarctic Circumpolar Current (ACC) to a narrow geographical region, making this the best place to measure the ACC's properties. Since 1993, a sustained hydrographic measurement programme led by NERC scientists has made high-quality full-depth hydrographic measurements across Drake Passage each Antarctic summer. These continent-to-continent measurements are unique: no other ocean basin has such good resolution over such a time period. The volume of water carried by the ACC dwarfs the Gulf Stream, so even small future changes in its properties could have a profound impact on the rest of the world's oceans. The longer the record grows, the better will be our ability to detect gradual long-term changes within the natural ocean variability. The Southern Ocean is unlike any other on the planet, due to its uninterrupted circumnavigation of the Antarctic continent. It is the conduit through which heat and freshwater, as well as biogeochemical properties, are transported between the Atlantic, Indian, and Pacific ocean basins. It also plays an important role in the ventilation of ocean interiors, via the formation of water masses around Antarctica and their distribution in the meridional overturning circulation. It is thus an extremely important part of the global ocean-atmosphere-cryosphere system and is both highly sensitive to and strongly involved in climate forcing. Although the Southern Ocean forms a continuous band around the high Southern latitudes, it is not of uniform width. Instead it is marked by several "choke points", defined by WOCE (World Ocean Circulation Experiment). One such choke point is the focal interest of this section: Drake Passage. Drake Passage is the narrowest stretch of water in the Southern Ocean, spanning approximately 800 km (500 miles) between the southern tip of South America and the northern tip of the West Antarctic Peninsula. A hydrographic section in Drake Passage designated as SR1 by WOCE was occupied by METEOR in 1990 and by scientists aboard the RRS James Clark Ross in 1989. A line just east of SR1, designated SR1b, has been occupied in 22 out of 24 summers since November 1993. These repeat hydrographic measurements have been made as part of successive NERC core and strategic research programmes, most recently Oceans 2025 Theme 10 and, from 2016/2017, ORCHESTRA (Ocean Regulation of Climate by Heat and Carbon Sequestration and Transports), a coordinated campaign of Southern Ocean observations and modelling aimed at quantifying the role of the Southern Ocean in global energy and carbon bugets and thus better understanding and predicting its part in the global climate system. More information on the Drake Passage repeat hydrography programme can be found here. GO-SHIP coordinates global decadal repeat ship-based hydrographic surveys (following on from WOCE and CLIVAR), as well as more-frequent repeats on selected sections including SR1b, in order to obtain the high-quality observations of the global deep ocean that enable us to track large-scale changes in ocean water properties over decadal time scales. The TICTOC (Transient tracer-based Investigation of Circulation and Thermal Ocean Change) project will use tracer measurements from repeat hydrographic lines including SR1b to distinguish which regional changes in temperature are due to global warming and which are due to ocean circulation redistributing heat (NERC). The three components of RoSES (Role of the Southern Ocean in the Earth System) focus on different aspects of the Southern Ocean carbon system to better understand the ocean sink of anthropogenic carbon dioxide (NERC). SOCCOM (Southern Ocean Carbon and Climate Observations and Modeling) began deploying biogeochemical Argo floats in 2014, and will use their data to improve representation of the Southern Ocean in numerical climate models with the goal of determining the Southern Ocean's influence on climate (NSF). Moorings deployed in the Orkney Passage in 2015 as part of DynOPO (Dynamics of the Orkney Passage) and continued by ORCHESTRA monitor AABW outflow from the Weddell to the Scotia Sea (NERC). The A23 repeat hydrographic section through the Weddell Sea and eastern Scotia Sea has been occupied every few years, and more recently annually, since 1995, to monitor and understand changes in Antarctic Bottom Water (NERC). High-resolution upper-ocean XBT/XCTD/ADCP measurements in Drake Passage have been made from the ARSV L. M. Gould multiple times per year since 1996 (NSF). Bottom pressures and temperatures at both sides of Drake Passage were monitored from 1988 through 2016 as part of the ACCLAIM (Antarctic Circumpolar Current Levels by Altimetry and Island Measurements) network (NERC). 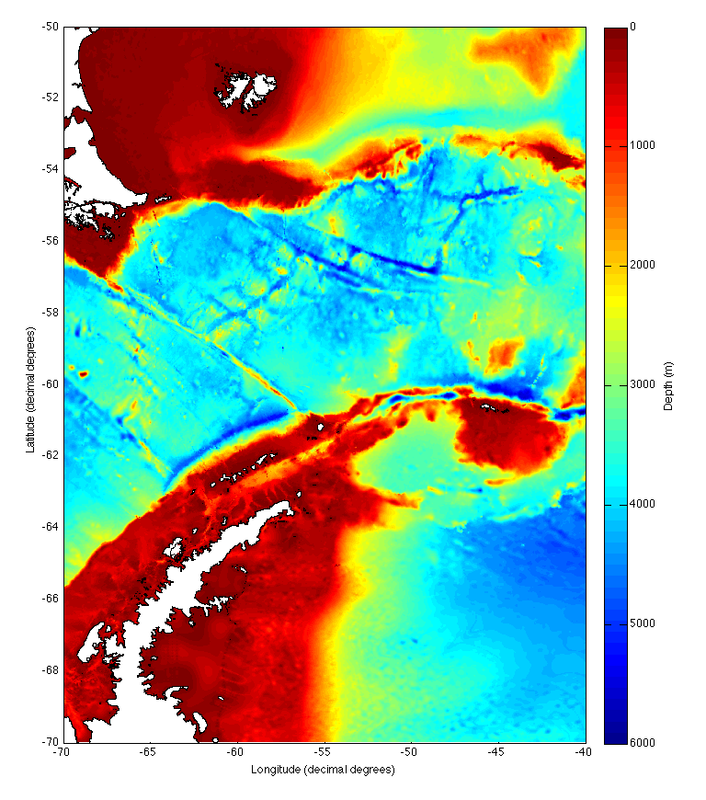 The SMILES (Surface Mixed Layer Evolution at Submesoscales) project investigated submesoscale surface layer processes in northern Drake Passage during a cruise in 2015 (NERC). The ChinStrAp project deployed gliders in Drake Passage in summer 2014/2015 to observe turbulent processes near the southern boundary (NSF). DIMES (Diapycnal and Isopycnal Mixing Experiment in the Southern Ocean measured rates of mixing in the ACC both upstream of and in Drake Passage over 11 cruises from 2011-2014 (NERC/NSF). Southern Ocean air-sea fluxes were monitored from the RRS James Clark Ross over the summers from 2010/2011 - 2012/2013 by WAGES (Waves, Aerosols and Gas Exchange Study) (NERC). Hydrography along the boundaries of the Weddell Gyre was measured by the ANDREX (Antarctic Deep Water Rates of Export) cruises in 2008-2010 (NERC). The cDrake project used 4-year time series from an array of CPIES in Drake Passage (2007-2011) to quantify ACC transport and balances of heat, momentum, and vorticity (NSF). The DRAKE experiment used an array of 9 current meter moorings across Drake Passage from 2006 to 2009 along with satellite altimetry to study ACC circulation (CNRS, CNES).